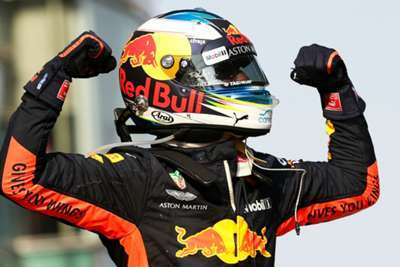 Daniel Ricciardo believes victory at the Chinese Grand Prix will strengthen his hand in contract negotiations as he looks to firm up his future. The Red Bull driver put on an overtaking masterclass in the second half of Sunday's race, after the team's decision to pit their drivers under the safety car paid dividends. Ricciardo's contract is due to expire at the end of the season and he has been mentioned as a potential replacement for Kimi Raikkonen at Ferrari. "I guess the plan was to still hold off a little bit [on negotiations]," he said. "Obviously getting a win is nice but the performance is still so-so ... we don't really know. "Obviously today we had really strong pace in the second half of the race and I think once we get to Europe it'll start to balance itself out. "But all three teams have had their moments so far this season, so it's interesting, it's fun and I don't think today hurt my position, so it's a good day." Ricciardo's win came after a turbo issue on Saturday left him in a race against time to take to the track for qualifying, his mechanics enlisting the help of their counterparts in Max Verstappen's garage to get the job done. "After yesterday I thought I would be starting the race at the back," he added. "The team were rewarded for getting out in quali, but this is the best reward possible. "I'm super happy for the mechanics as well." Speaking to Sky Sports, Ricciardo added: "I feel like a lot of the time you feel - not obliged to thank the team - but it's the nice thing to do. But I really, sincerely mean it 100 per cent with all my heart today. "Without them yesterday and without the strategy today we wouldn't have made it. "I'm sure the team feels as high as I do right now, and I'm super, super thankful they helped me pull this off today. "Just give me the chance to be in a title hunt and I really believe I'll be able to take it. I guess today was a good example of that."